On the 7th February, the video was re-loaded with the missing speech restored but with a few seconds deleted. It was a very unusual action for an entire speech to have been removed and it would have remained that way had Derby News not highlighted this situation. Some Cllrs took up the issue with Janie Berry, and the correction was made. What was Cllr Hussain speaking about? The debate Cllr Hussain was contributing to was as a result of the Conservative group putting forward a motion to call for Cllr Nawaz to be removed from the Communities Scrutiny Review Board. What emerged, questioned the mainstream version of Nawaz’s case. Hussain made some very bold statements. It was delivered with much anger. During this whole period his ire was directed to the Conservative group in the Council Chamber, however the Standards Committee was chaired by a fellow Labour Councillor, Baggy Shanker. The Committee, was made up of 3 Labour Councillors, 2 Conservative , 1 UKIP and 3 independent people. Janie Berry, the Monitoring Officer, was in attendance. After he had finished, Cllr Poulter ( member of the Standards Committee) then added some further nuance to the debate in Full Council. He recalled that the 3 Cllrs from the Labour group led the conversation , and led the decision making, and the conclusion that the “punishment” should “hit him in his pocket” – i.e. that he be removed from Committee posts. By not inviting Cllr Nawaz to the Standards Committee he was not given the opportunity to present his case, as required by the procedure. What is Cllr Nawaz’s position? “It was disappointing that the standards committee made its judgement without granting me the basic right to a hearing or opportunity to make my proper representations, and without having even received a complaint. In line with previous experience, Member Services, would pass the document to the Legal team ( headed by Janie Berry) to approve it for issue. They would arrange for it to be typed and printed on headed paper and returned to the Councillor. As he had received nothing to the contrary, Cllr Nawaz understood that it had been approved by the Legal dept. Cllr Nawaz was on the agenda of the Standards Committee on the 18th July 2017. Janie Berry told Cllr Poulter, in the meeting, that Cllr Nawaz was aware of the meeting – he wasn’t. Later that day, Cllr Nawaz received a call from a reporter at the Derby Telegraph to ask him if he knew about the meeting ; this was the first notification he had had of the meeting. The Standards Committee agreed to remove him from some/all of the Committees that he was on. The exact wording of the sanction was subject to subsequent disagreement between the members of the Standards Committee. Cllr Nawaz apologised to try and close out the whole affair. 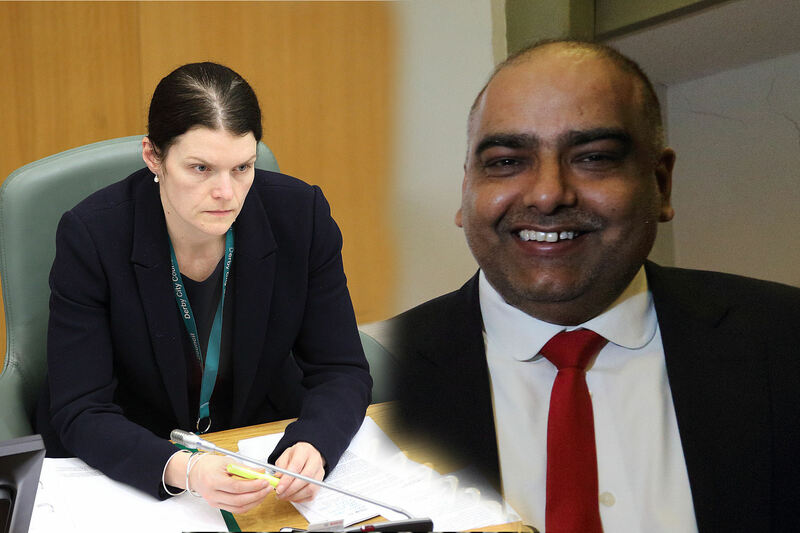 There was no identified “investigator”, no “complainant”, and the “subject member” – Cllr Nawaz was not able to make “representations and call witnesses”. The Committee made a decision based on one piece of evidence – the letter. The biggest failing in this whole story is that Cllr Nawaz was not given the right under the procedure to represent himself in front of the Committee. This is the procedure, and it was not adhered to. It is not for the Committee members to decide that they know all of the facts. The fact that the meeting proceeded, regardless of these failings, sanctions discussed / agreed and then subsequently disputed / partially implemented/ minutes “allegedly” changed, simply comes down to the incompetence of the Chair – Cllr Baggy Shanker. It is unclear how it is that the Monitoring Officer, Janie Berry, managed to communicate to the Committee that Cllr Nawaz was aware of the meeting, when he wasn’t. One would expect that occasions of this nature would be confirmed by positive communication in writing / phone calls. Cllr Nawaz is not the only Cllr who believes that letters forwarded to Member Services are automatically forwarded to the Monitoring Officer / Legal team for vetting and approval. If this is not the procedure then, again, perhaps some positive communication stating the actual position should be issued. The mis-communications and procedural confusion has been conflated by the party politicking of the opposition groups, and the rapid back-pedalling by the Labour group leadership on the outcome of the meeting, to the point that the real story has been lost. One person – the person who was involved in all stages of this saga, including the censorship of the Council video , the Monitoring Officer, Janie Berry. 1. Does your department routinely vet letters, documents prior to issue by Cllrs to make sure that they are legally compliant and ‘block’ them / ask for changes if necessary, to avoid any procedural mistakes i.e. to protect Councillors, and the Council? 2. Why did your department / Members Services not advise Cllr Nawaz that his reference letter breached the rules and advise him accordingly to avoid it being issued? 3. What was the actual complaint against Cllr Nawaz and who raised it and brought it to the Standards Committee? 4. Why wasn’t the case investigated in line with standard procedure? 5. Why wasn’t Cllr Nawaz given the opportunity to represent himself at the Standards Committee on 18th July, in line with the procedure? 6. Cllr Poulter stated in the Council Meeting on 24th Jan that you had confirmed that Cllr Nawaz was aware that his case was being discussed at the Standards Committee on that date. He maintains that he was unaware of this. How was he informed of the meeting date, and when, and can you explain why there was an ambiguity? 7. Why did you instruct the removal of the whole of Cllr Hussain’s speech from the Council video for 24th Jan when the vast majority of it was about the Cllr Nawaz case, was made in public, and was a matter of public record and interest?